Grizzly bears are relatively common on the outskirts of Canmore. Even though Canmore is a bustling town, the opportunities for viewing wildlife in and around residential areas are excellent. The valley floor provides habitat for many larger mammals, including elk (most often sighted on the Canmore Golf Course and along the west side of the Bow River). Other larger mammals present include white-tailed deer, coyotes, and black bears, all of which are regularly sighted within town limits. 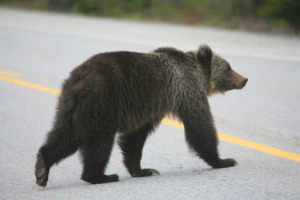 Grizzly bears are les common within town, but are often present around the edges of town, especially the wildlife corridors to the south and north of residential areas. Cougars are less common but reported sightings are most often reported on the north side of the highway in and above the Silvertip neighborhood. Would you like to see bighorn sheep? They are common on rocky outcrops above Spray Lakes Road as it leaves the Nordic Centre and east of town along the 1A near Gap Lake. Birdlife around Canmore is prolific. Mallard ducks are a popular attraction on Policeman’s Creek in downtown Canmore. Several active osprey nests can be seen along the banks of the Bow River; other permanent avian residents include great horned owls, jays, and ravens. Even if you’re not interested in photography, the Canadian Rockies Wildlife Photography eBook, by renowned wildlife photographer Wayne Lynch, is a great resource for searching out local wildlife, with many Canmore locations detailed.